The Cold Storage Kids Run is back for its second year running and is better than ever! This year’s Kids Run featured a longer route and a challenging obstacle course that promised an exciting day out for children and adults alike. 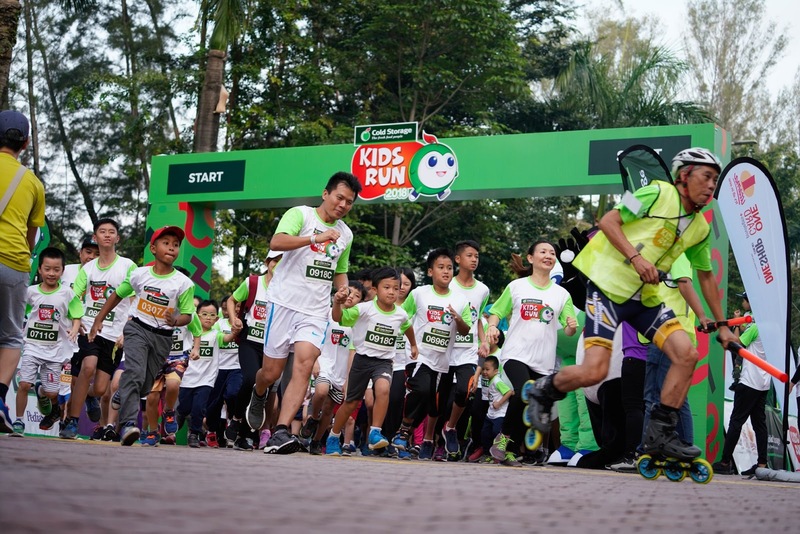 Part of an initiative by Cold Storage Malaysia to promote Malaysians on the importance of living a healthy lifestyle, the 2018 edition of the Kids Run aims to promote healthy routines from a tender age. Malaysia is one of the top four most overweight countries in Asia Pacific and the rapid rise of overweight children is alarming, as they are at a higher risk of becoming obese as adults and that could lead to many health complications.1 With the advancement of technology, most children and parents take for granted the importance of regular exercises and a balanced meal. Couple that with parents busy schedules, children tend to eat unhealthy food most of the time and do not get enough important nutrients that their body needs in order to grow. Cold Storage Malaysia is leading the conversation on promoting the importance of an active lifestyle as well as an adequate diet to the public, especially to the future leaders of our country. The Cold Storage Kids Run further emphasis their commitment in inspiring both children and adults, to make healthy food choices by providing a fine selection of fresh and high quality groceries in our stores. This event is part of their continuous effort in educating children on the importance of a balanced lifestyle since young as it could encourage them to start adopting to healthy habits in the future. Children today are smarter than we give them credit for. We believe that the duty of educating the children on living a healthy lifestyle falls on their parents. Therefore, by encouraging parents to also take part, the adults can lead by example and become a positive role model to their children when it comes to leading a healthy lifestyle. The Cold Storage Kids Run also gives us a chance to meet their customers personally and converse with them on the importance of eating healthy. Cold Storage want their customers to feel close at heart with them and appreciate their feedbacks as Cold Storage close to further cement their place as “The Fresh Food People” in Malaysia. Cold Storage Malaysia is also bringing the cheer up to 40 MyKasih Foundation primary school students beneficiaries from Sekolah Kebangsaan Bukit Lanjan (Asli) joining the fun-run towards a healthier lifestyle. 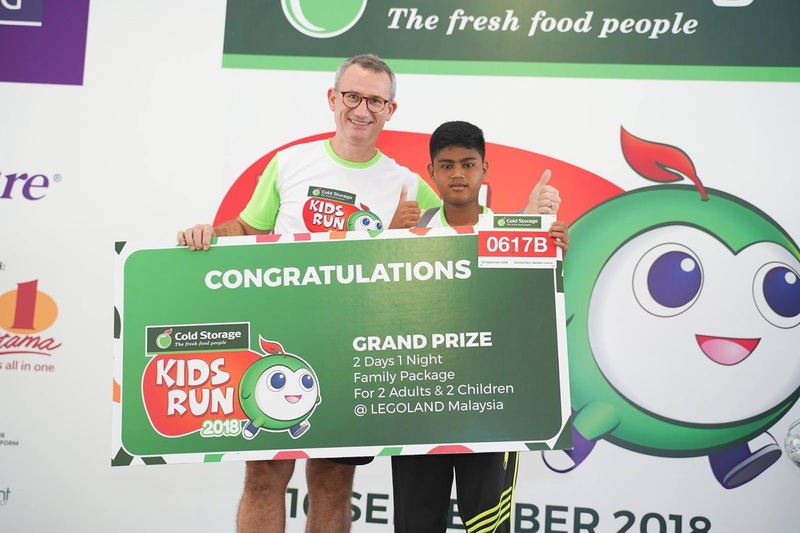 A total of RM40,000 from the Cold Storage Kids Run 2018 was channelled to MyKasih Foundation - a non-profit organisation that aims to help the less fortunate in Malaysia as part of Cold Storage Malaysia CSR effort. In addition to providing the students with cashless bursaries, the programme includes supplementary activities such as tuition, annual sports days, edible garden projects and installation of computer labs for 21st century learning. “We truly appreciate this gesture from Cold Storage and hope that other companies will come forward with their charitable giving to support the MyKasih ‘Love My School’ programme”, said Tan Sri Dr Ngau. Through the Cold Storage Kids Run, they hope to make a change by partnering up with multiple brands that share the same vision as them. “On behalf of Cold Storage Malaysia, we would like to extend our gratitude towards our event's main sponsors, Emborg, Pediasure, Korea Agro - Fisheries & Food Trade Corporation, Bestari, Darlie, Freedom, Goodday, Julies, Kewpie Malaysia, Kinder Joy, Milo, Prego, Bega, Sunquick, Tiger, PetitMiam, Anmum, O’ Fresh, Enfagrow, Facklemann, Garden Basket, Hot Wheels, KMT, Philips, Wyeth Nutrition Malaysia . We would also like to thank all our participants that joined us in making the Cold Storage Kids Run 2018 a huge success,” said Deplanck.